In everyday life, it can often be heard from several people like teachers, parents, administrators, Officers, reviewers etc. that particular student’s is interested in mechanical works therefore he would be an engineer, or a student may become a better musician in the future, a girl, will be more successful as a housewife in future or so and so will be a talented and able administrator. These types of statements of these individuals means that the concerned student, girl or person has such type of talent, ability or capacity which may play an important role in getting success in a specific sector. Such talent, aptitude or ability is usually congenital and it is called aptitude in the language of psychology. Knowledge of aptitude is an important factor in the field of educational, professional and psychological consultation. By identification of the aptitude of children, they must be educated and trained in those specific areas where they can excel. Forcing the children to join an aptitude-less field, is actually a sheer wastage of time, money, and power. At the time of selecting the candidates for education and employment, the aptitude of the individual should be kept in mind. Measurements of aptitude are discussed in this chapter. Aptitude indicates the specific ability and capacity of an individual in a particular area. Existing aptitude of a person is a set of his qualities that indicate its future capabilities. Aptitude of a person expresses his fitness to perform a task. Aptitude is not the name of a tangible object or ability but an abstract noun which expresses special attribute of the personality of a person. Aptitude is the symbol of the future capabilities while staying in future. Ability, interest and satisfaction closely relate to aptitude. All the aptitudes of a person are not same. Differences in different aptitudes of a person are natural. A person may have less aptitude for a work but he may have more aptitude for any other task. The nature of the aptitude is individual. In other words, individual differences are found in aptitudes. Differences in aptitudes of any two individuals are obvious. Though aptitudes of person remain stable but there may change, however these changes are gradual and very meager. General aptitude test can measure any normal action potential. These tests often measure the person’s general intelligence, learning ability or mental ability. These types of the test indicate the success in future of a person because by the general intelligence tests educational success of a student can be predicted successfully. So some scholars also like to call them scholastic aptitude test. It is clear that in the aptitude test category, the instruments like general mental ability tests or general intelligence test are used. These types of aptitude tests are generally battery type tests. In other words we can say that these tests are either a series or chain of tests or they have different sub-tests. There different tests or sub-tests indication a person efficiency in different fields and on the basis of the comparative study of the scored points in these tests, the areas with maximum aptitude are recognized. As these tests also indicate the differences in the aptitude, they are also called differential aptitude tests. These tests include tests related to verbal, numerical, place, mechanical knowledge, clerical capability, and behavioral tendencies. 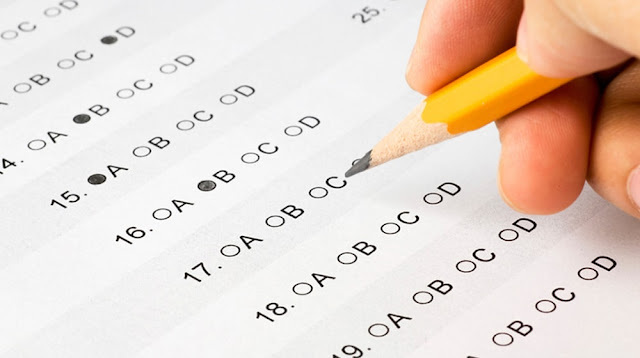 Discriminative aptitude tests (DAT), general aptitude test battery (GATB) , aptitude observation (AS), and aptitude classification tests are some of the foreign aptitude tests. Some of these tests have already been pursued in Indian conditions and are used in India. No fundamental and successful test of differential aptitude has been done in India till now. To give the knowledge of the differential aptitude test, following description of DAT by the psychological corporation of America is presented here. The Differential aptitude test (DAT) by Bannett, Seashore and Wesman, published by psychological corporation of America is one of the most famous and popular aptitude tests. This tests is for Class VIII to XII and its forms, S and T, are available. Every form has eight sub-tests which are arranged in two test booklets. One booklet includes four tests: verbal reasoning (VR) numerical ability (NA), abstract reasoning (AR) and clerical speed and accuracy (CSA) and a time limit of 30, 30, 25 and 6 minutes total 91 minutes, respectively, is determined for each test. Other booklet is comprised of other four tests: mechanical reasoning (MR), space relations (SR), spelling (SP) and language usage (LU) and they are assigned a time limit of 30, 25, 10, and 25 minutes (total 90 minutes). Though the time is fixed for all the eight tests, but only the test of clerical speed and accuracy is a speed test, while all others are power tests. The whole test can be administered in four or six sessions as per the situation. Scores are given for each test. The test makers also indicated a ninth scoring point, i.e., VR + NA which is expressed as general scholastic aptitude. These nine marks are changed into percentile ranks and Stanines. By using equivalent method for clerical test and semi severance method for other tests, the reliability coefficients of sub-tests are found from 79-97 for boys and 80-97 for girls. The predictive validity and concurrent validity of this test chain is obtained here. Marks in VR + NA, LU and VR can very well predict the grades in English. Marks in VR + NA, or from NA only, the grades in mathematics can be very well predicted. Marks in VR + NA, VR, NA or LU can very well predict the grades in science. Marks in VR + NA, VR, NA or LU can also very well predict the grades in social studies. The value of the correlation coefficient between the best marks in DAT in the sub-tests and the grades in different subject was from 40 to 60. The value of the correlation coefficient between the marks in VR+NA and the marks in general knowledge tests was from 70 to 85. The efficiency or capability of a person which predicts a person’s success in a specific field is called aptitude. With the help of aptitude, the success or failure of a person can be predicted. Aptitudes indicate the possible potentials of a person. Aptitude tests are used for measuring aptitudes. Aptitude tests are divided in three categories: (i) General Aptitude tests, (ii) Differential Aptitude tests, and (iii) Specific aptitude tests. The General aptitude tests measure the general efficiencies and capabilities of a person. These are very much like mental ability tests or IQ tests, which are capable of predicting the normal success and failure of a person. 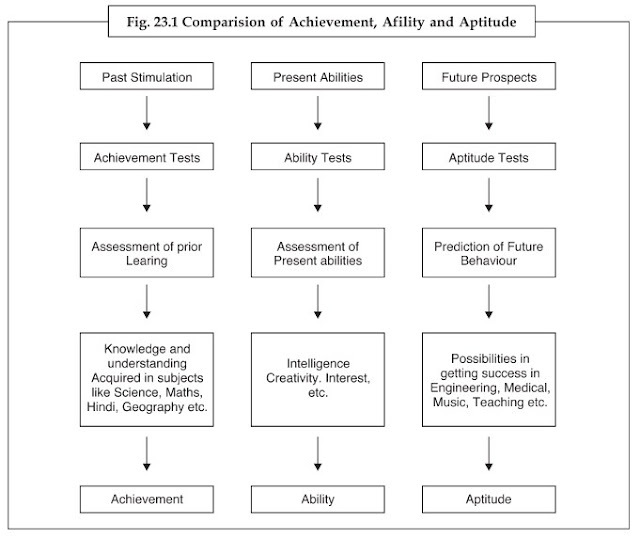 The Differential Aptitude tests indicate the aptitudes in different fields. They are general series type of tests. Specific aptitude tests are used to measure the aptitude of a person in any specific field. In India, there has been very minimal work in the field of aptitude tests.